Photo released on Monday, March 14, 2011 by the Sulu provincial government shows Interior Secretary Jessie Robredo and Governor Sakur Tan in the town of Jolo where a bomb exploded killing 5 people. 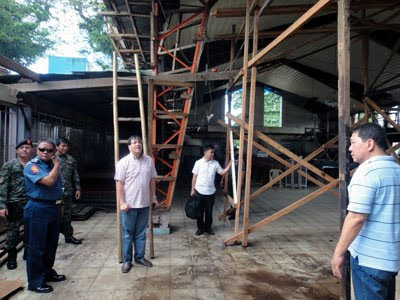 Photo released on Monday, March 14, 2011 by the Sulu provincial government shows Interior Secretary Jessie Robredo and Governor Sakur Tan at a Catholic church in the town of Jolo where a bomb exploded. 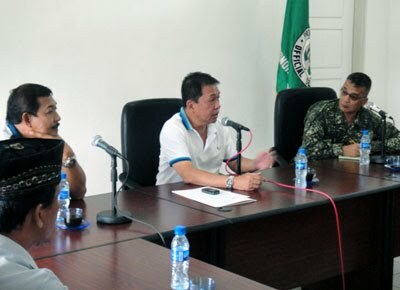 Photo released on Monday, March 14, 2011 by the Sulu provincial government shows Governor Sakur Tan during a peace and order conference in the town of Patikul in Sulu province. JOLO, Philippines (Mindanao Examiner / Mar. 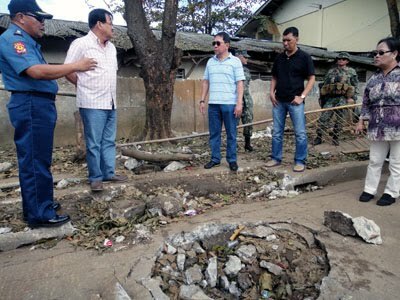 14, 2011) – Filipino Interior Secretary Jessie Robredo inspected the southern town of Jolo, site of a recent deadly bomb attack that left 5 people dead, officials said on Monday. Sulu Governor Sakur Tan accompanied Robredo as he inspected the site over the weekend and also held talks with security and local government officials. He also visited a Catholic church and the municipal police headquarters and both had been similar attacked by rebels in recent years. “Secretary Robredo’s tour have nonetheless allayed the fears of the populace because of attention our national officials are giving the incident,” said Tan who also presided over a provincial peace and order meeting that tackled various issues about Sulu’s peace and order situation.